Whether by plane, train, car or something else entirely, traveling can involve long hours and uncomfortable seating. The best way to ensure you arrive at your destination well-rested is to catch some zzz’s during your trip by using a travel pillow. If you're able to stretch out in the backseat of a car, then you can probably just bring a pillow from home. For almost any other situation, you’ll probably need a travel pillow you can wear while sitting upright which will be different than t﻿﻿h﻿﻿e pillows you use while lying down. 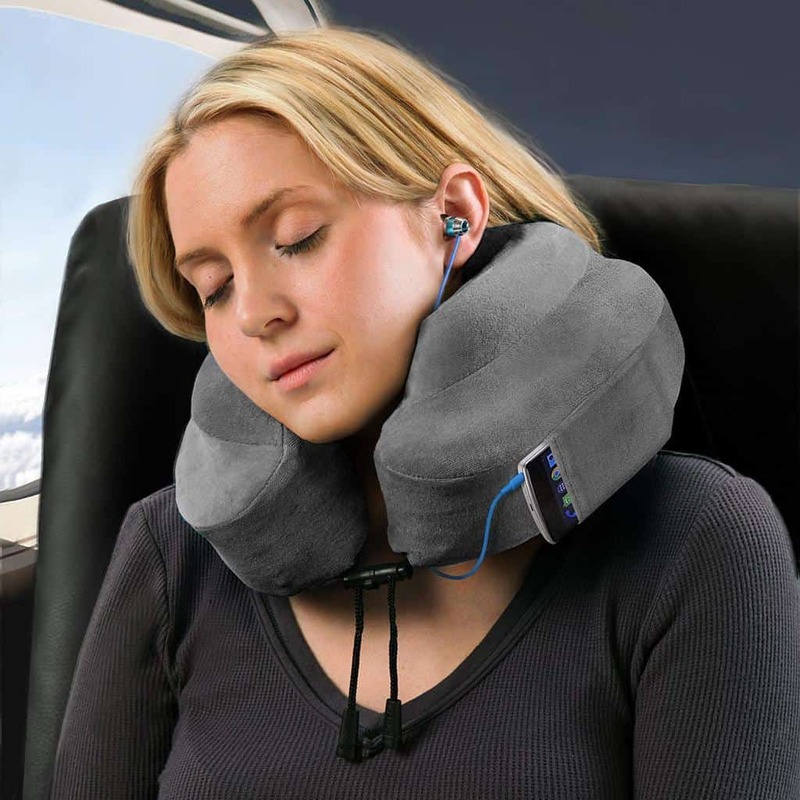 Travel pillows are designed to cradle your neck and support your head. This alleviates pressure on your neck and shoulder muscles. Most travel pillows are U-shaped although there are some unique exceptions (which we’ll detail below). Memory Foam – Most travel pillows are made of memory foam. This man-made material molds to the shape of your body, which reduces pressure points on your neck and shoulders. Your body heat interacts with the form, allowing it to conform to your shape. Foam pillows are rated by density. The higher the density, the more support provided. Six pounds is a high-density rating. Two to three pounds is on the lower end. A high-density rating provides the most support, but some comfort and softness is sacrificed. Memory foam provides the most support of any pillow filling. This is why memory foam is considered ideal for upright uses (such as air travel). Temperature – Memory foam can sometimes grow hot. The foam can collect heat from the body, especially over long periods of time. Smell – Sometimes the memory foam can emit an unpleasant, chemical-type odor. This is especially common in new pillows. Usually, a pillowcase will help reduce this smell. Although less common, travel pillows can also be filled with down and/or feathers. These are comfortable pillows. For the most comfortable pillow possible, try a pillow made of 50% down and 50% feather. These pillows don't provide as much support as memory foam. They're also not particularly compact. Inflatable pillows are also an option. As the name implies, you have to fill these pillows with air, either with an electronic device or your own power. Inflating a pillow can be a pain, especially when you’re on-the-go. Also, these pillows are generally considered to be the least comfortable. They don’t conform to the body very well. When traveling, the size of every item matters. You want to save space whenever possible. The perfect travel pillow not only provides comfort and support but is also easy to carry. Inflatable pillows can deflate down to a very small size, making them the most compact type of travel pillow. Unfortunately, you’re sacrificing a lot of comfort with an inflatable pillow. Down feather pillows are going to be the least compact. They generally can’t be reduced in size at all. Still, you can find down travel pillows small enough to use on a plane – but traveling with these pillows can still be a hassle. Memory foam pillows are generally considered the “Goldilocks pillow” when it comes to size and comfort. They provide the most support while taking up the least amount of space. Memory foam is easily compressed. Many memory foam travel pillows come with a travel bag. The pillow can be stuffed into the bag. Sometimes this reduces the pillow down to a quarter of its original size. Let's face it – travel can be a dirty adventure. You're often forced to be in close contact with large groups of people. You'll be sitting in seats where possibly hundreds of other people have recently sat. When you finally arrive at your destination, you don't want to bring any of those germs with you. This is why you want a travel pillow that is easy to deceive. Obviously, you want to select a material that is comfortable against your skin. You also want a cover that is easy to clean – preferably something machine washable. Durability is another factor you need to consider. Travel can be rough on any items. Memory foam pillows are going to be the most durable. Inflatable pillows – which certainly puncture proof – are typically the least durable. Down and feather pillows have middle-of-the-road durability. This pillow lets you feel good by doing good: Five percent of all purchases go towards cancer research at BCRFcure.org. But buying this pillow isn’t a charity. You’re getting one of the most popular pillows on the market. The Evolution Pillow has raised side supports that offer 360 degrees of head and chin comfort. There is also a flat back that prevents your head from being pushed forward. Adjustable front toggles hold the pillow securely in place. This pillow is easy to travel with on just about any trip. A compact, water-repellent travel bag compresses the pillow down to one-fourth of its original size. The pillow also has a media pouch that can hold a phone or MP3 player. Free memory foam earplugs are included. The pillow stays clean easily with a removable and machine washable velour cover. The unique J-shape stops your head from falling forward while also supporting your head and neck in the perfect position to the side. This pillow was named British Invention of the Year 2013. The J pillow is one of the most popular pillows sold in Europe – and it’s easy to see why. The J-pillow folds down smaller than most traditional U-shaped pillows, so travel is easy. Aside from use on trains and buses, the unique shape of the pillow is perfect for relaxing on the sofa at home. Also, many people who need to sleep upright due to medical reasons prefer the comfort and support of the J-pillow. Travelmate’s found the perfect balance between softness and support with this pillow. The thermo-sensitive foam molds to your neck and shoulders. It helps to relieve pressure points. Perfect for anyone who has to sit for long periods of time. Travel is easy with the built-in elastic strap. You can use the strap to carry the pillow or to attach the pillow to your carry-on luggage. A zippered, machine washable plush velour cover is also included. This pillow provides comfortable support virtually anywhere. The Travel Bliss is a popular choice among frequent travelers. Extra-strength high-density stitching holds the pillow together even in the most stressful environments. The back is thin and ergonomically-designed to prevent your head from falling forward. The HI-IQ dynamic thermal-sensitive memory foam molds to the shape of your body. The support provided by this pillow alleviates shoulder and neck pain. The Travel Bliss is recommended by many chiropractors. This pillow provides more support than bean-filled, down or inflatable pillows. Snap closure stabilizes the pillow. Can be attached to luggage handles. This pillow offers a few unique features. This is the only pillow that provides full lateral support for the upper body. This support allows you to fall asleep faster and stay asleep longer. This is also the only multi-use and adjustable neck pillow. You can position the pillow across your torso or down the side. The pillow can be worn as a messenger bag or even tethered to an airline or bus seat with the attached loops. This is an inflatable pillow. The pillow inflates with just a few breaths and can deflate easily. Inflatable pillows such as the Travelrest fold down to a fraction of their inflated size. This is one of the most compact travel pillows available. Perfect for when space is at a premium. We recommend all of these travel pillows. Each has several unique features that suit a variety of situations. All are durable, comfortable and provide plenty of support – even for long-term upright use. The right travel pillow allows you to arrive at your destination well-rested and ready for adventure.